Although car batteries last much longer than most batteries (3 to 5 years), they also eventually run out of power. When this happens, and it will, it is vital that you are ready to handle the situation. A dead car battery can be a real pain, especially when you have places to go. It can also become dangerous if your car dies in an unfamiliar area that is not close to home. Having a jump starter handy will quickly get your car running and back on the road. In order to understand how jump starters work, you must first understand how car batteries work. These rechargeable batteries use a chemical reaction to produce electrical power. The car’s engine is connected to the battery and receives the needed voltage to start running. When the battery is low on power, it can’t provide the amount of voltage need to start. Jump starters were created to give your battery the added boost of energy needed to start the car. Several different factors play a role in your car battery’s lifespan, including hot and cold weather. If you live in an area that experiences drastic temperature changes, your battery will most likely wear out faster. These extreme temperatures can also be hazardous to your health as well. Having a dependable jump starter is critical in getting your car back on the road and getting you to a safe place. In order to help you find a jump starter that meets your specific needs, we’ve reviewed the top-selling jump starters on the market and describe what each has to offer! This portable jump starter was built to last with features like heavy-duty cables, copper insulation, and a sturdy case that was designed to take on the rigors of everyday use. It comes with a powerful battery that kicks out 1,700 peak amps and 425 cranking amps and can start vehicles of all shapes and sizes. You'll find a number of great features that make it easy to use while extending your battery's life. 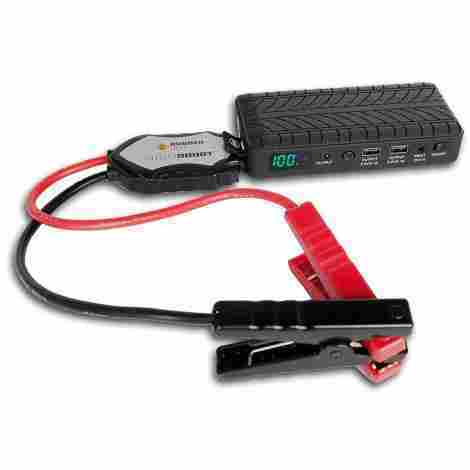 The Jump-N-Carry jump starter comes with a specially designed Clore Performer battery that not only delivers high cranking power but can also be replaced to give this product a longer service life. This jump starter is tailored to take on the toughest jobs by producing as much power as possible and delivering it to your vehicle. The heavy-duty cable leads are 46 inches long so you can reach the difficult areas and comes with industrial grade clamps that will ensure a good connection even through corrosion. There are several reasons that this jump starter is number one on the list, including high power output, heavy-duty components and a strong case that makes it extremely durable. This portable jump starter is small enough to fit in your glove box, yet powerful enough start you battery with 600 amps of peak current. This is a great product for people who may not have a lot of knowledge of how engines or batteries work. They have a lot of features that protect the user, battery and unit can provide up to 20 jumps per charge. It can also be used to charge laptops, phones, and other electronic devices. Car batteries contain some hazardous chemicals that can cause real damage if not properly handled. In order to prevent any injuries, this jump starter comes with short circuit protection, over current protection, over-charge protection, and overload protection. For those of us who are not very mechanically inclined, this model features an LCD screen that will let you know how much power you have left and the output voltage so you can avoid causing damage. This lightweight, portable jump starter has everything you need to get your car battery running again and many features that make it easy and safe to use. They are so confidant in their product that it even comes with a 3-year warranty. This small, featherweight jump starter is perfect for road trips. It can fit in the palm of your hand and is powerful enough to start cars, boats, and other recreational vehicles, ensuring that you will never be left stranded anywhere. 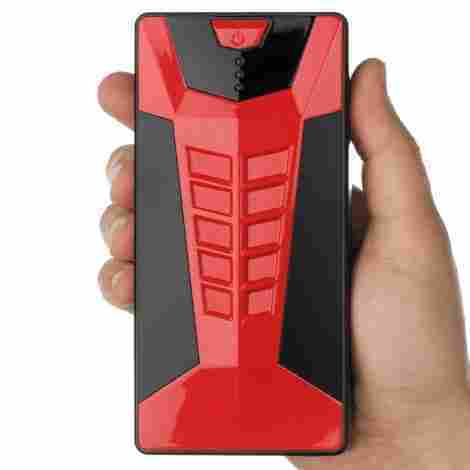 This is more than just a jump starter; however, it also has a built-in flashlight which can help you in the dark and send out distress signals and options to charge other electronic devices like smartphones and tablets. With a weight of only 2.35 pounds and the size of a smartphone, this portable jump starter is the ideal travel accessory. It still puts out up to 400 amp peak power for continuous reliability. You get several safety features such as anti-recharge and short-circuiting protection and LED lights that let you know how much energy you have left. 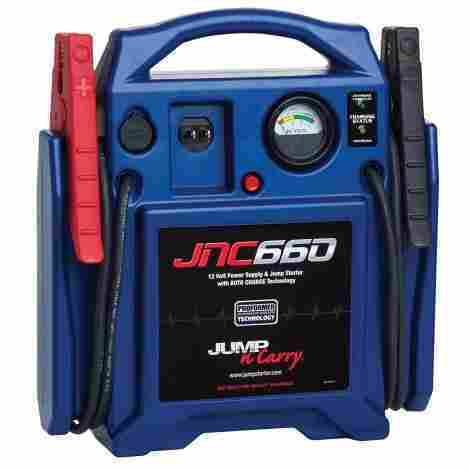 Its ease of use makes it one of the most effective portable jump starters on the market. For a great low price, you get a dependable jump starter that can keep your electronics and vehicle going when you need it most. They come in four different colors and include several accessories including a zippered case. If you've ever been stuck at beach, parking lot or on the side of the road due to a dead battery, then you know how important it is to have a product like the Rugged Geek RG1000. With enough power to boost an average car more than 20 times on a single charge, this compact jump starter is a must-have for all road trips. It also comes with some fantastic features such as new safety technology, 2 USB ports and a laptop charging port. This jump starter exclusively features Intelliboost technology which protects users by taking the danger out of jump starters. The jumper cables have duel power tips and only allows current to flow when it is safe. Having a portable jump starter is no good if it doesn't have enough energy to boost your vehicle. The LCD is easy to read and shows the vital information like the battery charge level. 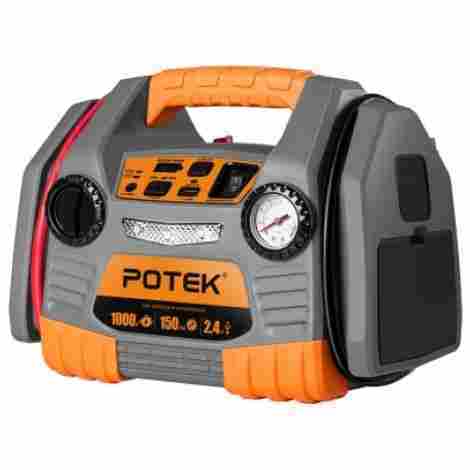 If you like your portable jump starter to have all the bells and whistles, then this is the model for you. It also comes with all the accessories you need including a carrying pouch, 12V car charger, 3-in-1 USB charging cable and Intelliboost cables. 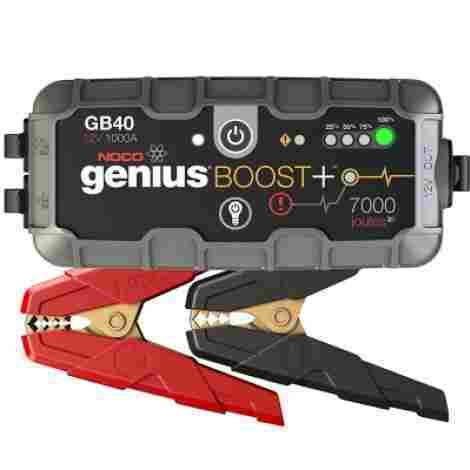 NOCO created the GB40 Genius jump starter to be super lightweight, compact and powerful enough to start gas engines up to six liters and diesel engines up to three liters. There are several safety features that protect you, the battery and the jump starter from damage. Besides being able to jump start your car, it can also recharge other devices like tablets, phones, and laptops. NOCO understands that not everyone is comfortable or very knowledge about batteries, engines, and jump starters. So to ensure everyone's safety they've included features like reverse polarity protection and spark-proof technology. The GB40 is helpful in more situations than just dead batteries. It also features an ultra-bright LED flashlight that has SOS and emergency strobe modes and a charger for your phone in case it dies. There is no value you can put on safety, and the extra features the GB40 comes with makes it a great traveling accessory. It has several safety features and free lifetime customer support. This multi-functional jump starter is the perfect traveling companion and does way more than just jump your vehicle. Imazing uses advanced safety technology to ensure that anyone can safely use this product, making it a must-have for experienced and inexperienced drivers alike. It also comes with several features that can be helpful during emergency situations that don't have to do with dead batteries. There's no such thing as too safe, and the Imazing knows this. That is why the 1200A portable jump starter comes with eight security features including, short circuit protection, reverse polarity protection and over temperature protection. When you're out on a long road trip, a dead battery is just one of many problems you may encounter. That is why this portable jump starter also features SOS lighting signal, dual USB quick charge, LED flashlight and much more. With a 1200A peak current, this portable jump starter is powerful enough to start most 12V vehicles up to 30 times in a single charge. The instructions are easy to read and follow, and you get all the accessories you need, including cigarette charger jump cable, USB cable and a compressive case. This portable jump starter is not only great at jumping most vehicles that are stuck on the side of the road, but it works just as great with recreational vehicles such as ATV's, motorbikes and snowmobiles. It also comes with some fantastic features that protect your safety while preventing damage to your battery, engine or jump starter. The powerful lithium battery will ensure that a long lifespan as well. Sometimes you need more than a charged battery to help you out of an emergency. The 2 USB ports are not only compatible with most USB charging specifications, but it also charges your devices at a much faster rate than others. 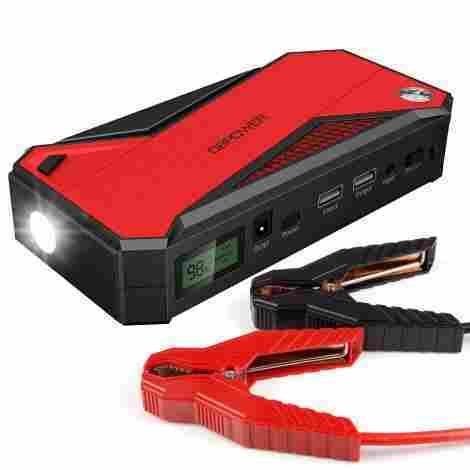 The GOOLOO 800A portable jump starter is a powerful emergency tool that features an ultra-bright LED flashlight to help you see at night. The flashlight has three different modes including emergency strobe in case you need to get help. 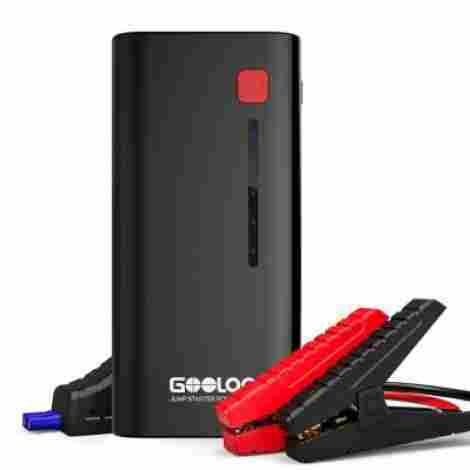 Not only do you get some incredible safety and emergency features with this powerful and portable jump starter, but GOOLOO also offers its customers a money back guarantee and excellent customer service. 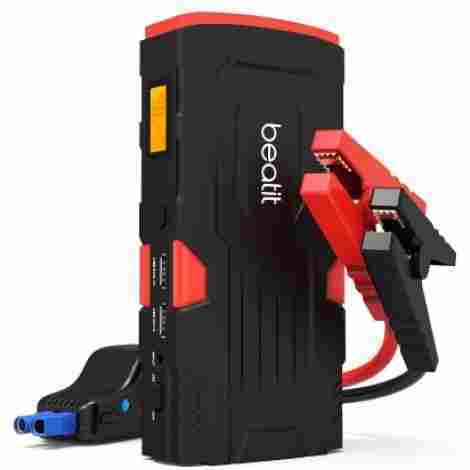 Designed as a compact and portable jump starter, the BT-D11 800A jump starter is strong enough to start gas engines up to 7L and diesel engines up to 5.5L yet can easily be carried around in a purse or glove compartment. It's safe and powerful lithium battery can jump start your vehicle up to 30 times on a single charge. It's easy to use, and features LED lights that let you know if you are correctly connected. Beatit uses the latest technology to ensure that you are safe every time you use this product. The smart clamps include several safety measures including over discharge protection, short circuit protection and over current protection. In order to ensure that you are using the jump starter correctly, it features LED lights that that stay green when properly connected and ready to jump. The blinking red light lets you know if you are using it correctly. It's always a good idea to have jump starters with you every time you hit the road. This jump starter is robust, small and lightweight and is equipped with lots of safety and emergency features that make this a great choice. 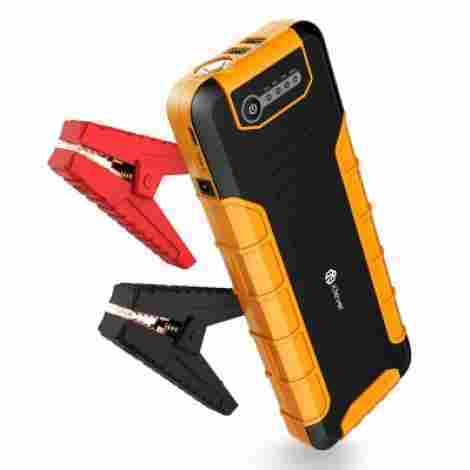 This is one of the most powerful portable jump starters on the market with 2000mAh capacity and a peak current of 800A. You can efficiently use this to jump all vehicles with 12V engines, including boats, lawnmowers and cars. This jump starter can also be used as a battery charger that will quickly charge most new devices, including laptops, iPhones, and game consoles. For maximum safety, iClever uses the latest technology and added a 3-PIN detector that can read the car's battery voltage. This will ensure that you are not overcharging and possibly damaging your battery and putting yourself in danger. This model features high-speed PD 30W input which allows it to recharge up to four times faster than the usual 5V/2A input. It uses a specially designed USB C power delivery system and also has a 30W wall charger. This incredible jump starter can charge your vehicle up to 40 times in one single full charge, so you don't always have to worry if the jump starter has enough energy. The heavy duty clamps are made of copper and come with thick cables that can withstand 800A current. This jump starter designed is the perfect emergency tool as it not only instantly jumps your car, but it can also inflate your tire and charge your phone. If you like taking long road trips or going camping, then this can be a real lifesaver. You also have the option of charging it while still on the road or at home, ensuring you that you'll always have enough power to get the job done. 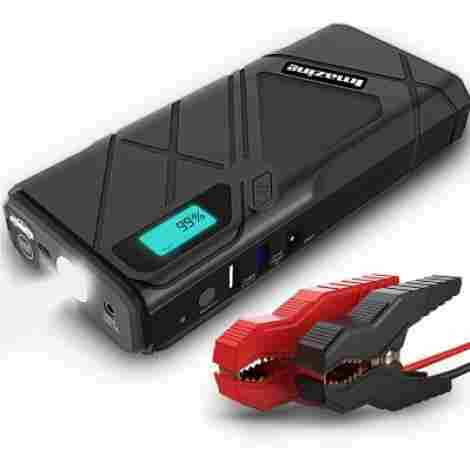 This multi-functional jump starter features a 150PSI air compressor that can easily inflate your car tire and get you back on the road in no time. You can also use it to inflate balls, bikes and other inflatables! If you're always on the road, you may not always have time to recharge the jump starter when you're at home. To help keep it fully charged and at the ready, it comes with a DC adapter that allows you to charge while driving. This portable power station is the perfect emergency tool. It produces 1000 peak amps for a powerful jump and features a 12V power outlet socket for smaller appliances during a blackout. The air station is a big plus that most portable jump starters don't include. Jump starters have come a long way since the basic jumper cables first came out. They come in a wide variety of different shapes and sizes, and most have high-tech features that make using them safer and more manageable. But not all jump starters are the same or offer the same advantages. So it’s essential that you understand your needs in order to find a portable jump starter that can meet all your requirements. Some jump starters have flashlights, USB ports and LED indicators, while others have air stations, 12-volt outlets, and LCD screens. If you like taking long road trips, going camping with the family (consider your precious children) or just need something in case of an emergency, then check out the reviews and find the model that suits your needs best! When looking to purchase a jump starter, you must first have an idea of what your needs are. There are three types of jump starters, and because not everyone’s requirements are the same, it’s a good idea to understand what each one of these can do. Of the three different types of jump starters, this is the most basic. It’s just two connection cables with clamps on each end. It’s, simple, portable and easy to use. However, the problem with these is that you’ll need another vehicle or battery to provide the power source, and sometimes that may not be an option. Plug-in battery chargers have the benefit of being able to provide a massive burst of amperage so you can start the engine. This is great in a situation when the battery is completely dead. Another advantage of plug-in jump starters is that they can act as a battery charger as well. The main disadvantage of these types of jump starters is that they need to be plugged into a power source in order to work. So if you’re nowhere near an electrical outlet, then they’re of no use. These portable jump starters are basically sealed boxes with maintenance free batteries and jumper cables that connect to the car battery. If you’re on the road a lot, then these types of jump starters are your best option. They come in a wide variety of sizes and power output, so you will need to know the size of your engine in order to find one that will work best for you. The problem with these is that sometimes people will overuse them on dead batteries and driving around on a dead battery can deplete the lifespan of your battery. You also need to make sure that its battery is also charged otherwise it won’t have enough power to jump your vehicle. The ability of your jump starter to perform in severe weather is very important. The cranking current capacity of a lead-acid battery could deplete up to 50% in freezing climates. This means that if your jump starter also uses a lead-acid battery, then you have to assume that it also lost 50% of its cranking current output. Jump starters that use lithium-ion batteries lose less power, but they also decrease in performance. Make sure that you read the jump starter’s manual to find out how cold weather affects its efficiency. Other things to look out for are water and heat resistance. Not all jump starters provide the same amount of energy, and since batteries come in different sizes, not all batteries need the same amount of power to start. It is essential to know how much peak power and how much cranking power a jump starter can provide. Although they work together to get the engine going there is a difference, and you should know it. Peak power is the maximum amount of current a jump starter can provide. Most deliver around 1000 amps, but you also find models with more and less peak power. You may think that the higher the amps, the better, but that really depends on the battery type. Peak power comes as a short burst of high current that is meant to immediately turn over your engine and cranking process of your engine. The problem is that this current quickly decays and if your car doesn’t start right away it won’t have enough power to get it going. Cranking power is the number of amps the jump starter delivers after the initial burst if more cranking is needed. It is a more stable current and actually replicates the job of your car’s battery. Most jump starters provide around 400 amps of electrical current during cranking and should not last for more than 5 seconds. If you continue to push the cranking power for longer than that, it can damage both the jump starter and battery. When researching jump starters, make sure that you check on how much peak power and cranking power it delivers to ensure it’s enough. For some people, using a jump starter seems pretty straightforward and simple. However, not everyone is familiar with the process, and there can be some risks if you are not careful. If you are one of these people, lucky for you, most new jump starters come with safety features to ensure that nobody gets injured. Here are some of the most important safety features you should look for when shopping for a jump starter. This is a feature that limits the amount of electrical current a jump starter will put out in order prevent damaging the device. When jump leads touch each other, an extremely high electrical current will pass between the negative and positive battery terminals which can lead to a short circuit. This is very dangerous because not only will it damage the device, but it can also cause the battery to explode. This is a vital safety feature to have. During a power surge, the jump starter can put out a voltage that is too high, which leads to battery damage. This type of protection prevents this from happening. Finding a jump starter that lasts is important. You need it to be able to be able to survive multiple uses and cold, hot and wet weather. If your jump starter is made from cheap plastic, then don’t be surprised if it breaks easily. Metal jump starts are definitely more durable, but they are also bulky and not very practical for traveling. Try finding something in between that is both lightweight and sturdy. The purpose of a jump starter is to get you out of an emergency situation. If you spend money on a jump starter, you want it to work when you need it most. The best way to check if a model is reliable is to read the reviews about it. Look for models that have warranties and are made by reputable companies. If you’re going on a long road trip, you may not always have access to an electrical outlet. Having multiple charging ports such as USB ports, DC voltage outlets, and laptop charger outlets can really come in handy. A flat tire can be just as bad as a dead battery, if not worse. Having a portable jump starter that has a built-in air compressor can be a real lifesaver. Although it doesn’t work as quickly as the ones you find at gas stations, it still does the job. This is a great feature to have for those emergencies during the night. Not only does it allow you to see what you are doing, but most models have multiple lighting modes such as SOS and strobe lighting so you can alert other people. Q: What do I need to look for in a car battery Jumper? A: Although new battery jumpers come with a lot of great features, there are three essential things that you need to know before you make a decision. First is the cranking amp rate, which is the amount of electrical current that it provides. The bigger the engine, the higher the cranking power you will need. The second factor you need to take into consideration is how much voltage the jump starter puts out. Older vehicles use 6V batteries while most modern cars have 12V batteries, and larger vehicles like RV’s and commercial trucks use 24V batteries. So you’ll want a jump starter that can handle the energy needs of your vehicle. The third thing you need to know is how long of a cable you will need to reach the battery. You’ll want to be able to reach the battery’s terminals easily and comfortably so you can ensure safe operation. Q: What safety measures do I need to take when using jump starters? A: The first thing you will need to do before anything else is to read the manual. There are many different types of jump starters, and some may have extra steps that need to be taken. As a rule of thumb, when you are connecting the leads, start with the positive terminal first, which is usually colored red or has a + sign. Then connect to the negative terminal, which will be black or have a – sign. You should also check to see if the jump starter has an on/off switch, which will help prevent sparking while connecting the cables. Q: Can a jump starter start a completely dead battery? A: Not all jump starters have the power to start a dead battery because some of the energy will also go to the starter motor, which takes reduces the amount of current that reaches the dead battery. To ensure that you don’t run into a problem like this, you’ll need a jump starter with high cranking power, the higher, the better. Q: I have multiple vehicles, including a commercial truck, a sedan, and several recreational vehicles. Can one jump starter work on all of them? A: It depends on the jump starter. Keep in mind that a large vehicle, like the commercial truck, will need at least 500 cranking amps while the other vehicles need less. A smaller jump starter might be powerful enough for the sedans and recreational vehicles, but it won’t do anything for the commercial truck. A heavy-duty jump starter that puts out a lot of cranking power will start all your vehicles, but its size and weight may not make it practical to carry around. In a situation like this, you may want to consider getting a second, smaller jump starter that can fit in the glove box and still put out enough amps to start the other vehicles. Q: If I buy a bigger jump starter and use it on a smaller car, does it need to have overload protection in order to avoid damage my battery? A: In order to start your vehicle, the battery will only pull as much energy as it needs from the jump starter, so there is no need to worry about damaging the battery or vehicle’s electrical system. Q: Do I need to have reverse polarity protection on my jump starter? A: If your jump starter has reverse polarity protection, then it will warn you if you connected the cables to the wrong terminals before starting it and causing damage. Even if you are an experienced mechanic, an extra safety feature is always a good thing. Q: What’s better, a plug-in jump starter or a portable jump starter? A: That will depend on your needs. Plug-in jump starters usually have higher peak power and cranking power and can start larger vehicles. On the other hand, they are also generally bigger and heavier, which makes them impractical for traveling. Portable jump starters are more limited in the amount of power it can produce, but are smaller and lightweight, making them ideal for road trips. Some of the newer model pack a can also put out a pretty high cranking amp, so having one around at all times is always a good idea. Q: Can I still jump start my car if I have a bad starter? A: That would depend on how much damage the starter has. The extra charge from a jump starter may initially help get your car started, but once the starter has gotten too bad, it won’t help anymore. Q: How do you charge a portable jump starter? A: How you charge a portable jump starter will depend on the model you get. There are a wide variety of jump starters made by different companies, and each come with their own unique features. For the most part, they are pretty easy to charge usually come a DC adapter that you can use to plug into an electrical outlet. Q: What's Better, A Plug-In Jump Starter Or A Portable Jump Starter?